This vignette of Mary Brown’s life is drawn from the records of residents in New York Poor Houses and Alms Houses. From 1875 State law required that institutions record details of individuals in their care on a standardised form to be sent to the State Board of Charities. The form recorded a number of details about the individual, their parents, their origins and also of the cause of their dependence. It also offered an opinion on the prospect of them escaping dependence in the future. A number of the 1875 records deal with individuals first admitted in earlier decades- making it possible to explore some from the 1860s. 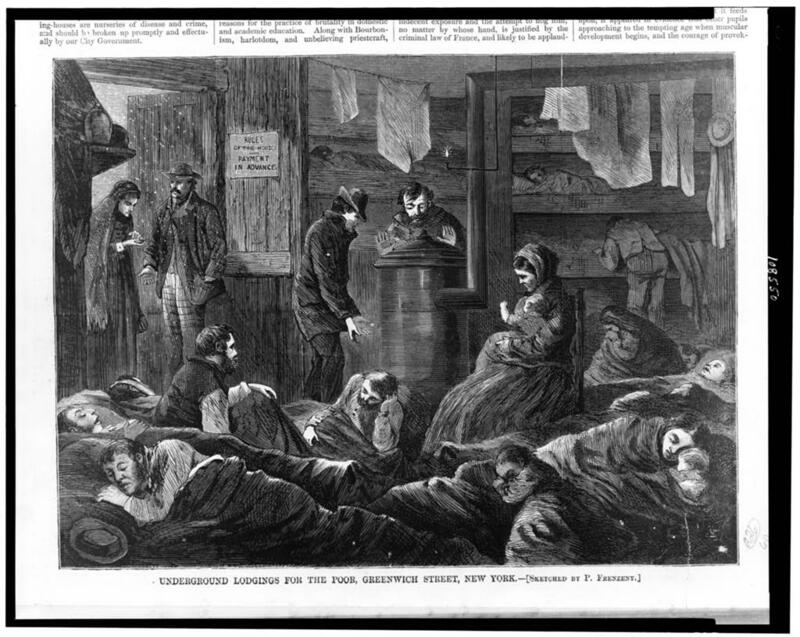 The fifty people I decided to look at were all born in Ireland, and all had been admitted to New York Poor Houses and Alms Houses between 1861 and 1865. In selecting them, I chose those whose place of origin had been determined to at least county level. What is immediately apparent among the group is the dominance of older people. There were often catastrophic consequences for individuals who in later life found they could no longer make a living. The concept of ‘old’ is very different to ours- two of those in this sample who were admitted partially as a result of ‘old age’ were only in their 40s. Also notable is how social status did not necessarily protect you from the Poor House if you found yourself alone- for example Bridget Rowley’s father had been a minister, Rose McHegan’s father a distiller and Esther Turner’s father a gentleman (and Esther herself a teacher), yet all ended up in institutions. Similarly it is interesting how a number of those supposedly at the lowest strata of society, such as laborers, had managed to educate themselves and become literate. Aside from old age, a number of illnesses recur among the sample. Chief among them are blindness and rheumatism, which put an end to the working capacity of a number of the group. Other common causes which led to admission were things such ‘insanity’, paralysis and alcohol dependence. 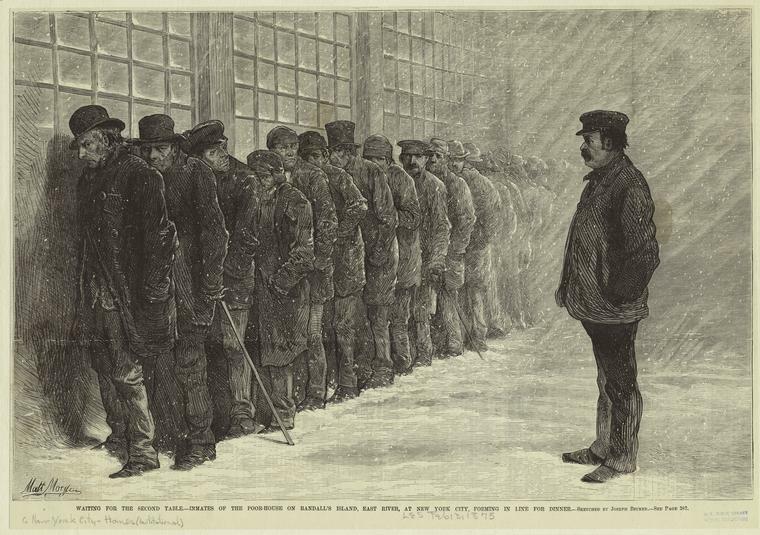 The records show just how precarious life could be for immigrants in 19th century New York. There are a number of cases where both a husband and wife were in the Poor House; perhaps most poignant are the references to people who had siblings or children who were alive and remained self-supporting, but who clearly could not offer charity to their own family members. This is something I have come across repeatedly in dependent parent pension files- children who had married and started families of their own were simply unable to spare money to assist their parents, so precarious was their own financial position. In the stories below are some especially heartrending examples of hardship. We meet people like Mary Hill, another woman who on the face of it should not have found herself in a Poor House- her father had been a physician. Yet we learn from her record that her father had placed her in the Poor House soon after they arrived in the United States from Co. Meath. Ann Bean from Cork had been just a girl when she went into the Poor House, also shortly after her arrival from Ireland. A single woman who appears to have spent much of her life in institutions, she was recorded in 1863 as suffering from ‘puerperal insanity’ which can develop after childbirth. You will find brief descriptions of the circumstances of each of the 50 people I looked at below, based on their Poor House records. Each individual is listed chronologically according to the date of their original admission. If you are interested in learning more about Poor Houses and Alms Houses in the United States and their history you can read an essay by Dr. David Wagner on the topic here. For more on New York Poor Houses by county see here. James O’Rourke, Co. Limerick. Admitted to Albany City Alms House, 7th June 1861. Ellen Griffin, Co. Waterford. Admitted to Kings County Alms House, June 1861. Ellen was recorded as a 60-year-old widow. Her father and mother, both from Waterford, had been a farmer and housekeeper respectively. Ellen also listed her profession as housekeeper, and she had two living children. Her cause of dependence was rheumatism and destitution. Unable to perform any laborer, her entry records that she would later spend four months in Kings County Hospital. It was felt at the time that she would probably always remain dependent. Jane Redding, Cork city, Co. Cork. Admitted to New York City Alms House, 27th September 1861. Jane was a 30-year-old single woman when admitted. Her father had been a steward. Jane had some education growing up in New York, as she was able to read and write. She had spent her own working life as a domestic, but was now laid low as a result of rheumatism. Despite this, she was still able to carry out house work, but was nonetheless categorised as permanently dependent. Elizabeth White, Dublin city, Co. Dublin. Admitted to New York City Alms House, 8th January 1862. Elizabeth was a 50-year-old widow. Her father had been a merchant, a fact which undoubtedly helped her to gain an education, as Elizabeth could both read and write. Elizabeth worked as a domestic, but like Jane Redding was now afflicted with rheumatism. The main labor she could now pursue was sewing. Elizabeth was classed as being permanently dependent. Bridget Rowley, Roscommon town, Co. Roscommon. Admitted to Columbia County Poor House, 4th February 1862. Mary Foley, Co. Sligo. Admitted to Kings County Alms House, 1st May 1862. Ann Sullivan, Longford town, Co. Longford. Admitted to New York city Alms House, 27th August 1862. Ann was a 49-year-old single woman. Her father had been a laborer in Ireland, and she worked as a domestic. Ann was illiterate, and had become dependent as a result of destitution. Capable of general house work, she was classified as permanently dependent. Cornelius McCarthy, Co. Tipperary. Admitted to Monroe County Poor House, 1st October 1862. Cornelius was a 63-year-old married man when he was admitted. Cornelius had a common school education, and worked as a carpenter. His father had been a farmer. The reason for his admittance was old age and destitution- it was reported that he had been an inmate of Poor Houses for a total of eight years. In the remarks it was noted that ‘C. McCarthy is husband of No. 26 [his wife]- both drunkards‘. John Haley, Co. Galway. Admitted to New York City Alms House, 3rd October 1862. John was a 54-year-old married man when he was admitted. In Ireland his father had worked as a farmer. John himself was as a laborer, but could no longer make a living as he was now blind. He was recorded as permanently dependent. James McCormick, Edgeworthstown, Co. Longford. Admitted to New York City Alms House, 8th October 1862. James was a 39-year-old single man when he was admitted. His father had been a farmer, and James had received some education as he was able to read and write. James himself was an ostler, or stableman and had become a naturalized citizen. He was admitted as he was partially blind, and it was felt he would remain permanently dependent. Anne McMullan, Co. Down. Admitted to Kings County Alms House, December 1862. Anne was an 80-year-old widow when she was admitted. Her father in Co. Down had been a farmer. Anne was recorded as having no occupation and no education. The cause of her dependence was given as old age and destitution, from which she was given no prospect of recovery. Peter Finnerty, Ballymore, Co. Westmeath. Admitted to Kings County Alms House, 1862. Margaret McNeely, Co. Antrim. Admitted to Sullivan County Poor House, 1862. Bridget Nolan, Co. Westmeath. Admitted to Kings County Alms House, 1862. Bridget was a 5o-year-old widow when she was admitted. Her father had been a farmhand, and Bridget was a housekeeper. She was illiterate. The cause of her dependence, from which she was given no prospect of recovery, was paralysis. Mary Traynor, Newry, Co. Down. Admitted to Sullivan County Poor House, 1862. Catherine Grievens, Ballymore, Co. Westmeath. Admitted to Kings County Alms House, 7th January 1863. Bartley Haley, Co. Sligo. Admitted to Monroe County Alms House, 13th March 1863. Bartley was a 50-year-old single man when he was admitted. He had arrived in St. John’s, Canada from Ireland before moving on to New York. He had worked as a laborer, and although he was able to read he couldn’t write. His father had also worked as a laborer. He was admitted as a result of consumption, for which he had also been a patient in St. Mary’s Hospital. He was given no prospect of recovery from his dependence. James O’Harra, Co. Limerick. Admitted to Monroe County Poor House, 14th June 1863. James was a 40-year-old married man when he was admitted. He was a laborer, as his father had been before him. He could read but not write and had never become a naturalized citizen. The cause of his dependence was recorded as a ‘rupture.’ He was thought able for light farm work, but the potential for his recovery was deemed improbable. It was noted that ‘J. O. Harra is a chronic pauper. He is husband to No. 34’ [suggesting his wife was also in the Poor House]. Rose McHegan, Galway, Co. Galway. Admitted to New York City Alms House, 27th August 1863. Rose was a 59-year-old widow when she was admitted. Her father had been a whiskey distiller, suggesting he may have had some means, but despite this Rose was unable to either read or write. She had worked as a domestic during her lifetime. She was admitted as a result of old age and destitution, and it was felt she would remain permanently dependent. Ann Bean, Co. Cork. Admitted to Monroe County Poor House, 1st October 1863. Ann was 23-years-old and single. She was not a naturalized U.S. citizen, and could neither read nor write. She was single and worked as a domestic, but was also recorded as having one living child. 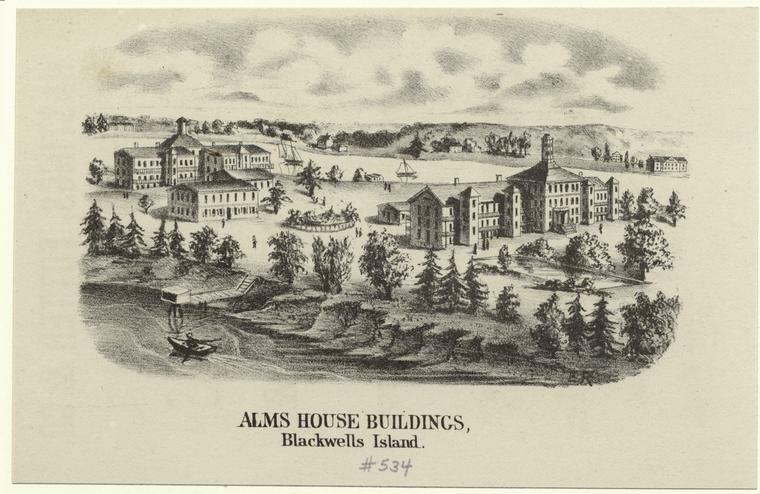 She was employed in the Monroe County Alms House and by 1875 had been an inmate of Poor Houses for 12 years. She was said to have no prospect of recovery from her cause of dependence. It was noted that she first entered the Poor House system shortly after her arrival in the United States, and that she suffered from ‘Puerperal Insanity’– a mental illness that follows childbirth. The catalogue of hardships she had clearly faced in her young life since leaving Ireland are difficult to comprehend. Mary McCarthy, Co. Offaly. Admitted to Monroe County Poor House, 1st October 1863. James Mahon, Co. Wicklow. Admitted to New York City Alms House, 9th October 1863. James was a 44-year-old married man when he was admitted and was now a naturalized citizen. His father had been a laborer, but James seems to have been at least somewhat upwardly mobile, as he was a blacksmith. The cause of his dependence was blindness- form which it was felt he had no prospect of recovery. Daniel Sullivan, Co. Cork. Admitted to Monroe County Poor House, 21st November 1863. Patrick Carr, Co. Galway. Admitted to Monroe County Poor House, 26th December 1863. Patrick was a 67-year-old widower when he was admitted. He was naturalized U.S. citizen who could read but couldn’t write. He worked as a laborer -as his father- and had one child living. The reason for his dependence was as a result of a crippled knee; he was given no prospect of recovering from his dependence in the future. Mary Hill, Kinnegad, Co. Meath. Admitted to Kings County Alms House, 1863. James White, Co. Galway. Admitted to Ontario County Poor House, 1863. Catherine Quinn, Dublin, Co. Dublin. Admitted to New York City Alms House, 20th January 1864. Catherine was a 50-year-old widow when she was admitted. She was able to read and write and had worked as a tailoress- her father before her had been a carpenter. The cause of her dependance was Eryspielas (also known as St. Anthony’s Fire, an acute infection) and debility. She was able to work at sewing. James Foy, Co. Cavan. Admitted to New York City Alms House, 16th March 1864. James was a 42-year-old married man when he was admitted. A laborer, he had become a naturalized citizen and was able to read and write. He was described as being of intemperate habits, and although he was able to help around the ward it was felt that he would remain permanently dependent. Esther Turner, Trim, Co. Meath. Admitted to New York City Alms House, 27th April 1864. Esther was a 71-year-old married woman when she was admitted. Both her parents were English- her father, whose occupation was recorded as a ‘gentleman’, was from Salisbury and her mother was from Rockport. Esther could read and write and had worked as a teacher. Everything about her background suggested she should have avoided the Alms House, but she found herself there nonetheless. The cause of her dependence was blindness. It was felt she had no chance of recovery. Mary Schackion,Co. Kerry. Admitted to New York City Alms House, 18th May 1864. Mary was a 28-year-old single woman when she was admitted. Her mother had been from Kerry, while her father was a Co. Clare carpenter. Mary was unable to read or write and had worked as a domestic. The cause of her dependence was rheumatism, from which it was felt she was unlikely to recover. Sarah Hanlan, Killeshandra, Co. Cavan. Admitted to New York City Alms House, 5th August 1864. Hugh Kelly, Co. Down. Admitted to New York City Alms House, 19th November 1864. Hugh was a 63-year-old single man when he was admitted. Like his father, Hugh was a laborer, but he was also able to read and write.The cause of his dependence was rheumatism and destitution- it was felt he would remain permanently dependent. Michael Cox, Crosshill, Co. Roscommon. Admitted to Orleans County Poor House, 20th December 1864. Michael was a 56-year-old widower when he was admitted. Described as having a ‘good education’, Michael’s father had been a Tyrone farmer, his mother was from Leitrim. Michael had made his living in America as a farmer and had become a naturalized citizen. The cause of his dependence was given as insanity and it was recorded that he was unable to labor. He was classified as likely to remain dependent. Mary Quinn, Cavan town, Co. Cavan. Admitted to Kings County Alms House, 1864. Mary A. Kirby, Belfast, Co. Antrim. Admitted to Columbia County Poor House, 15th February 1865. Mary was a 55-year-old widow when she was admitted. Her father had worked as a laborer. Mary’s education was described as ‘limited’, and she had spent most of her life engaged in housework. She had two surviving children. 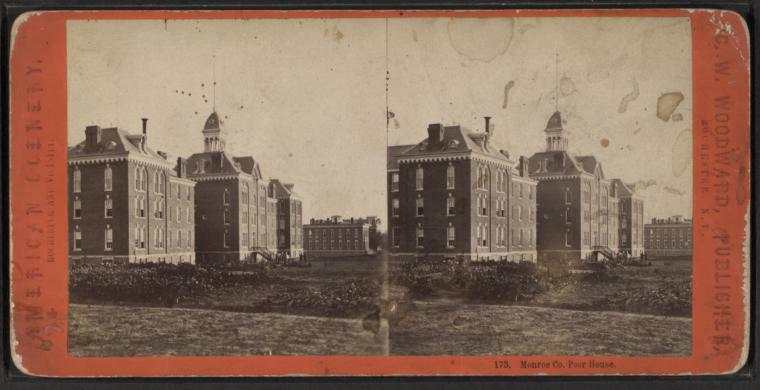 Admitted partly as a result of sickness, she was given no prospect of escaping dependency. Ellen Norton, Kildare, Co. Kildare. Admitted to New York City Alms House, 17th February 1865. Ellen’s parents had both been from Co. Mayo. Her father had worked as a laborer, and Ellen was a domestic. She was unable to read, and no head money had been paid for her. The reasons for her admittance were destitution and partial paralysis. Although she remained able to sew, she was regarded as being permanently dependent. Lawrence Smith, Co. Sligo. Admitted to New York City Alms House, 6th March 1865. Lawrence was a 40-year-old single man when he was admitted. He had not as yet become a naturalized U.S. citizen. In Ireland his father had been a laborer, as was Lawrence. Lawrence was also able to read. The cause of his dependence was the fact that he was ‘diseased’ and had a stiff knee, making him unable to work. He was classified as permanently disabled. Daniel Hayden, Co. Tipperary. Admitted to New York City Alms House, 21st April 1865. Daniel was a 46-year-old married man when he was admitted. The reason for his admittance was recorded as insanity and destitution. He was described as capable of light work, but was permanently dependent. It was recorded that Daniel was ‘quite incapable of giving any reliable history of himself.’ He also spent time in a lunatic asylum. Edith Delahunty, Co. Dublin. Admitted to Kings County Alms House, April 1865. Edith was a 61-year-old widow when admitted. Her father had been a storekeeper, and she had engaged in housework. Edith was able to read and write and had one child living. Despite her surviving child it was noted that she was homeless and destitute, and was able to perform only light labor. It was felt that she would probably remain dependent. Margaret Berry, Co. Sligo. Admitted to Kings County Alms House, 16th May 1865. Margaret was 83-years old and widowed when she was admitted- the oldest woman in the sample. It was unknown how long she had been in the United States as Margaret was unable to tell anybody. The reason for her cause of dependence was described as ‘insanity’ and she was deemed to be unable to perform any labor. It was determined that she would remain dependent, and recorded that staff were unable to learn anything of her past history. Catherine Reynolds, Sligo town, Co. Sligo. Admitted to New York City Alms House, 29th July 1865. Catherine was a 61-year-old widow when she was admitted. Her father, a laborer, had been from Mayo, her mother from Sligo. Catherine herself had worked as a domestic, but was unable to read or write. The reason for admittance was described as old age and destitution. She was classed as permanently dependent. Ellen Clary, Ballinamona, Co. Tipperary. Admitted to New York City Alms House, 12th August 1865. Ellen was a 61-year-old single women when she was admitted. Her father in Tipperary had been a farmer. Ellen was illiterate, and had spent her working life as a servant- blindness and destitution had forced her into the Poor House. She was listed as permanently dependent. John Shay, Co. Cork. Admitted to Monroe County Poor House, 26th August 1865. John was a 48-year-old single man when he was admitted. John worked as a laborer, as had his father before him. He was able to read, but unable to write. He was admitted as a result of Bright’s disease of the kidneys, which meant he was unable to work. John was given no prospect of recovery. Bridget Hughes, Mohill, Co. Leitrim. Admitted to New York City Alms House, 1st September 1865. Patrick Haud, Carrickmacross, Co. Monaghan. Admitted to New York City Alms House, 11th September 1865. Patrick was a 65-year-old widower when he was admitted. He had become a naturalized citizen. In Carrickmacross his father had been a wheelwright. Patrick had been a farmer but was admitted due to old age, deafness and general disability. He was described as permanently dependent. Catherine Brown, Aghada?, Co. Cork. Admitted to Kings County Alms House, 1865. Catherine was 50-years-old and widowed when admitted. She had been in New York for 8 years. Her father was recorded as being a farmer from Co. Limerick. She was unable to read or write and was a housekeeper by profession. She had one child. Her cause of dependence was described as resulting from old age and destitution. It was determined that she would remain a dependent. Timothy Donovan, Co. Cork. Admitted to Ontario County Poor House, 1865. Timothy was a 57-year-old widower when he was admitted. He had landed in Quebec before making his way to New York 12 years later. He had worked as a laborer but had a problem with drunkenness. The reason for his dependence was described as intemperance. He remained capable of doing light work around the house, but it was felt he had ‘no hope’ of recovering from his dependence. John Dunn, Co. Dublin. Admitted to Kings County Alms House, 1865. Bridget McGee, Banbridge, Co. Down. Admitted to Kings County Alms House, 1865. Mary O’Connor, Co. Galway. Admitted to Kings County Alms House, 1865. Mary was a 65-year-old widow when she was admitted. She could read but could not write. Her father had been a stone mason; Mary herself had no listed occupation. She had one living child. The cause of her dependence was old age and destitution- it was thought should would most likely remain dependent. Interesting and sad. With the big numbers of Irish coming into the area over that period, did the numbers of Irish appear higher then pepole from other countrys per the percent of the local population? I mean all the backlash against the irish ( no irish need apply, ect) does it point to more of a discrimination or just people worn out from years of hard labor and leaving most if not all of there family back in Ireland? And with out the extended family support they were subject to the control of the state, government? Many thanks for the comment. That is something I am not sure of but it is hard to believe that the huge influx did not have an impact- indeed the payment of ‘head money’ which was required on immigrants was specifically to counter the potential they may quickly end up in the Poor House system. Many fell foul to unscrupulous individuals as well of course- unfortunately including family members as we see from a couple of these examples. No problem at all, be my guest! 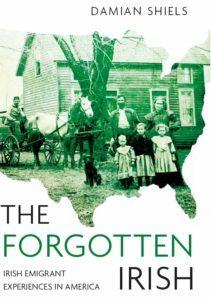 Really interesting breakdown by historian Damian Shiels of Irish immigrants in New York Poor Houses in the 1860s. Lots of Irish counties and surnames. Very powerful, as always. Thank you for this. And great illustrations too. Damian, thank you for a look into a forgotten part of our history. Thank you even more for making sure that a part of these peoples’ story is not forgotten. Wish I could learn if there are records of my Jacob Feistel who died at Work house on Blackwells Island in 1994. Thanks for keeping the people you list “alive” and not forgotten. Thanks for your comment- really glad you enjoyed reading it.